So when I moved into the office, I had way more space than I needed. Consequently my crap kind of exploded all over the place. My rock collection was no exception. I ended up having them all piled on the heating grate under the window. This served double duty, not only was it a place to pile the rocks but it also helped regulate the air, which in the winter is set at "Thermochronic total fusion", and in the summer "Cryogenic cold trap." So I had to rearrange all of the crap in my office, including the rocks. I've decided to photograph and post about some of my favorites. First, I want to draw a distinction between my rock collection and my sample collection. I've been collecting rocks since my first Introductory Geology field trip (heh, some of those first Wisconsin Ordovician dolomites and glacial erratics are still in a bucket in my parent's garage.) 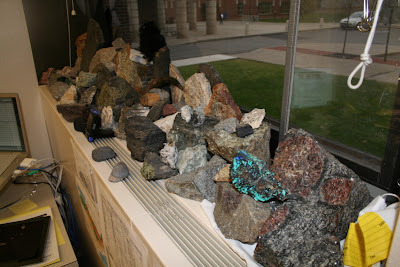 Rocks in my collection were all picked up on field trips, during field work, while hiking, plus a few gifts. I rarely took very good notes on the samples when I picked them up, or if I did the notes are long gone. This was especially a problem early in my career as a geologist, I've been trying to work on it, but the end result is I have a lot of rocks with vague pedigrees. Samples, on the other hand, I could take back to their place of origin and more than likely put them exactly where they came from. Samples all have GPS coordinates, they are marked on maps, and I have pictures of the outcrops before and after sampling. Why I can't replicate that for random rocks I pick up I have no idea. So I moved all of my collection over to my side of the window, it is a little more compact, but I think it still works. Notice how I am covering up about a third of the air vent. Today's sample is one of my personal favorites. It is something I picked up during my first year in graduate school, when I was a field assistant for my office-mate. Incidentally, Clastic Detritus provided the original inspiration for putting this rock on a post. (And, as a general inspiration, Loose Baggy Monsters recent post about her desk also inspired me to both clean and post a general shot of my workspace. Unlike her post, however, you can actually see my desk in these pictures.) As far as I remember, it is an Early Cambrian shale that I collected along the Transcanadian Highway in eastern British Columbia, just east of Golden B.C., and about as close to the Burgess Shale as you can get on the highway. I remember my office mate telling me we were actually in a late Pre-Cambrian unit, but perusing as many geologic maps as I can find makes me think we were firmly in the Cambrian. I'll hunt some more, but we'll see. Anyways, these are burrow trails in a really old shale. A trace fossil! Our ancestors! This has always been one of my favorites to show off. Whenever I've participated in people's practice qualifying exams I use this as one of the test rocks. 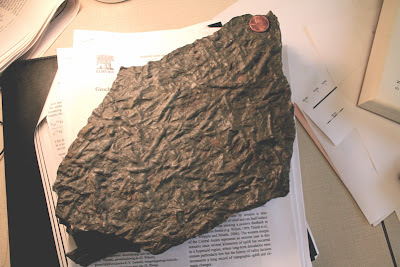 It is amazing how many people want to call it a metamorphic rock, staurolite schist or something. So more to come, some with better explanations. 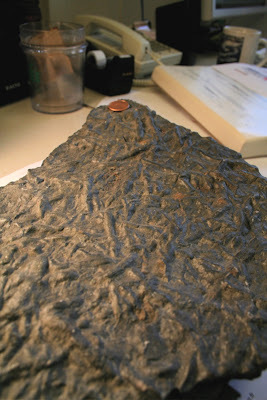 But I bet that most professional geologists reading this blog have similar piles in their office. Show them off! Let me know and I'll link in this post. Also, there are outcrops and roadcrops.... so what are these called? Deskcrops? Workcrops? Any suggestions? I am trying to play with the word diamictite, but it is just not working right now. By the way, lovely Gore Mountain garnets there! Looks like a mantle xenolith there over the radiator grates, too. My mantle xenoliths are one of the coming attractions! I always wonder if my grad school building is still isostatically rebounding after my removal of rock samples. I agree, this could be a great theme. I wonder if there are any similar hand samples among the geobloggers. I've got some better pics of the Gore Mountain garnets here. After the Loma Prieta earthquake, when Stanford's Geology Corner was closed because of earthquake damage, we had to clean out the eaves around the attic office space. Everything was slated to be thrown out. Somebody (it may have been Peter Fiske, who went on to get an MBA as well as a PhD) decided that it would be a real waste to throw away a hundred years of grad student junk. So we held two big yard sales and sold as much of it as we could. We made $25,000, took a field trip to the Alps, and started a tradition of grad-student-run field trips. The rocks were the biggest success. However, we also attempted to sell other stuff. It was pretty funny to see Elizabeth Miller realize that we had found her old hiking boots and were attempting to sell them for something like $5. Yes, the famous Stanford Alpine Club, that is one of my favorite stories. I unfortunately never went on a SAP trip, what a grat idea though. The xenoliths are from New Mexico, they'll be deskcrop #2. You call them deskcrops; I call them pet rocks. It would make me very happy to host good photos of any geologist's pet rock. See the starting hoard at About.com Geology.